Count Pawel Edmund Strzelecki, one of the most effective agents working for famine relief. If Aesnath Nicholson was one of a diverse group of visitors drawn to Ireland to witness, or to help with relief, as the Great Famine spread with lethal intenstity throughout rural Ireland, I am not too surprised to find a Polish count among them. Sir Pawel Edmund Strzelecki found refuge in Britain having served in the Prussian army, and other adventures. He became a tutor to a young girl of a noble family, where both he and his student fell in love. He was thrown out by her father. Still only 26 years of age, he was employed to run the extensive estates of Prince Sapieha, in the Russian-occupied part of Poland. The prince regarded him fondly, and generously provided for him in his will. The family objected, but eventually a settlement was made allowing Strzelecki to begin a world tour, and to enjoy a variety of careers in which he displayed his fearlessness as an explorer, his brilliance at organisation and leadership, and a generous humanitarian outlook. Returning to Britain after a successful exploration of the Australian outback, he was honoured and treated as a hero. A visit to Ireland quickly told him that the Great Famine was out of control. Believing he could help in the distribution of food, he persuaded the newly formed British Relief Association (BRA ) that it should appoint him relief officer for the impoverished districts of Mayo, Sligo and Donegal. He was convinced that in order to save lives, especially the children, immediate action had to be taken. Despite the government’s reluctance to spend any money on relief, he produced a loaf of bread made from black rye flour, which was cheaper to produce than from unbolted wheaten flour. It could be delivered directly to children at schools. He required immediate funds for his bread, and to pay bakers and a small army of distributors. By March 1848, having received the impressive sum of £92,968., he was able to produce his bread and began distribution. Within the year his scheme was feeding an extraordinary 200,000 children. Aesnath Nicholson, who had a strict philosophy about ‘nourishing food’ was appalled at Strzelecki’s bread. She objected that the black, rye flour was a cheap substitute for better flour. She described the finished product as ‘sour, black with the consistency of liver’. It looked, she said, ‘like a sod of black turf’. In her extensive tours around the stricken countryside, and having witnessed the terrible 1847-1848 winter of hunger and suffering in Erris, where she had distributed food and clothes, she noticed that the children in the care of the Presentation Nuns in Cork looked normal and healthy. ‘How did the sisters manage to see that the children thrived? Because they were fed on a diet of Indian meal’. While Nicholson’s ideas about nutrition were sound, and her regime probably offered a better diet for children, porridge made from Indian meal demanded equipment for preparing the corn, and boilers to process the meal into digestible porridge. Given the primitive conditions of rural schools, the black bread, though it may have been less salubrious, did not require any special preparation. So incensed was she that she sent a sample of the black bread to the British Relief Association, to let them know what food was considered appropriate to give to Irish poor children. We do not know what its reply was. Did Nicholson’s frustration and anger inadvertently help bring to an end that association’s financial help? I do not know; but for a short period the black bread certainly kept children alive. Having worked among the Irish poor in New York, and having employed young Irish women in her boarding houses, she realised that education was the best preparation for emigration. She visited schools, celebrated the good that she found, and criticised the limitations imposed by class, poverty and proselytism. 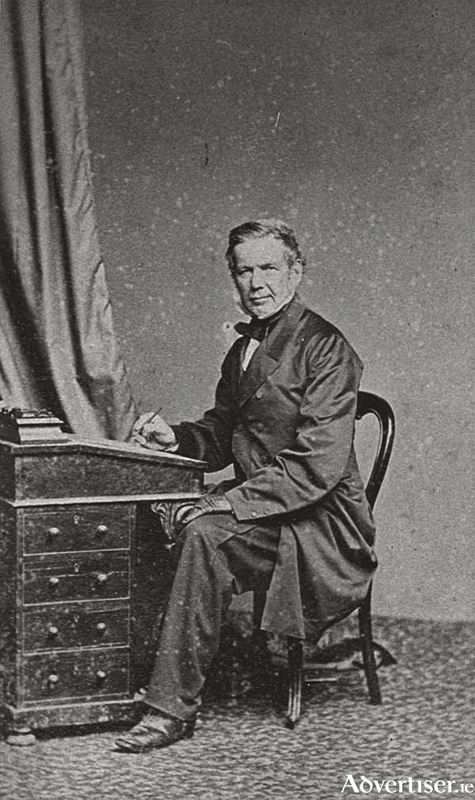 Nicholson returned to America in the Autumn of 1848. She must have been exhausted from her journeys, and battles. Next week: After the Great Famine, the workhouse in Mountbellew off loaded the ‘dead weight’ of uneducated young girls, and packed them off to Canada. NOTES: *It is difficult to understand Travelyn’s attitude to the Great Famine today. He disapproved of the Irish, and believed that the famine was a sign of God’s disapproval too. Following a brief visit to Ireland, he wrote a highly misguided and wrongful report in which he predicted an early rebellion, described warlike preparations, accused Catholic priests of fomenting the rising, abused Daniel O’Connell as being actuated by ’the vulgar but nevertheless very powerful motive of saving himself from pecuniary ruin’, and related a number of conversations with Irish peasants so hair-raising that it is probable he had been a victim of the favourite sport of ‘coding’ a stranger (The Great Hunger, by Cecil Woodham-Smith, page 60 ). ** Even though Strzelecki had no official status for relief, he returned to Ireland in June 1849 to distribute a small fund raised that month. He was acutely aware of the suffering of the Irish peasantry. He testified to a House of Commons committee later that the smallholders were ‘skinned to the bone’ by successive years of famine. *** She wrote two books: Ireland’s Welcome to the Stranger-an Excursion through Ireland in 1844 and 1845, and Annals of the Famine in Ireland in 1847, 1848, and 1849. Both have been republished by The Lilliput Press. I am leaning on Dr Maureen Murphy’s article Asenath Nicholson, and school children in Ireland, from Women and the Great Hunger, published by Quinnipiac University, USA.